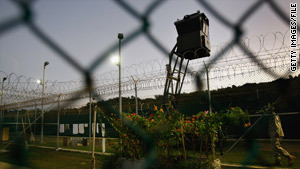 Guantanamo Bay is being considered as a possible location for Haitians fleeing their country after the earthquake. Washington (CNN) -- The U.S. military is gearing up for a possible influx of Haitians fleeing their earthquake-stricken country at an Army facility not widely known for its humanitarian missions: Guantanamo Bay. Soldiers at the base have set up tents, beds and toilets, awaiting possible orders from the secretary of defense to proceed, according to Maj. Diana Haynie, a spokeswoman for Joint Task Force Guantanamo Bay. "There's no indication of any mass migration from Haiti," Haynie stressed. "We have not been told to conduct migrant operations." But the base is getting ready "as a prudent measure," Haynie said, since "it takes some time to set things up." Guantanamo Bay is about 200 miles from Haiti. Currently, military personnel at the base are helping the earthquake relief effort by shipping bottled water and food from its warehouse. In addition, Gen. Douglas Fraser, commander of U.S. Southern Command, said the Navy has set up a "logistics field," an area to support bigger ships in the region. The military can now use that as a "lily pad" to fly supplies from ships docked at Guantanamo over to Haiti, he said. "Guantanamo Bay proves its value as a strategic hub for the movement of supplies and personnel to the affected areas in Haiti," Haynie said. As part of the precautionary measures to prepare for possible refugees, the Army has erected 100 tents, each holding 10 beds, according to Haynie. Toilet facilities are nearby. If needed, hundreds more tents are stored in Guantanamo Bay and can be erected, she said. The refugees would be put on the leeward side of the island, more than 2 miles from some 200 detainees being held on the other side, Haynie said. The refugees would not mix with the detainees. Joint Task Force Guantanamo Bay is responsible for planning for any kind of Caribbean mass immigration, according to Haynie. In the early 1990s, thousands of Haitian refugees took shelter on the island, she said.